The latest version of the Android Native Development Kit (NDK), Android NDK r16 Beta 1, is now available for download. It is also available in the SDK manager via Android Studio. NDK r16 is a big milestone for us, because it's the first release that we're ready to recommend that people start migrating to libc++! More on this later. We've also updated libc++ and its related projects, so this release has improved support for C++1z. Keep in mind that until C++1z becomes C++17, everything included is subject to change. The NDK has a library called libandroid_support that backports libc APIs that libc++ depends on that weren't available on older releases. The reason we've been unable to endorse libc++ (as implemented in the NDK) until now has been a lack of confidence in this library. The focus of r16 was to rewrite this library for improved stability. Since libandroid_support is now a smaller library, your app's behavior should more closely match the behavior of the system. As an example, libandroid_support previously included an alternative implementation of part of stdio. While some features got backported to ICS, it also meant that any bugs in the alternate implementation would be present on all OS releases since the bug was baked into your app. In the new version of libandroid_support, we've removed this so you'll be missing some features on older devices (almost exclusively things that no one uses, like %a support in format strings), but your apps using libc++ will be smaller and more reliable for not having these features. So, why should you switch to libc++? First and foremost, the other STLs will not be supported going forward (this has been noted in our roadmap for quite some time). We've been using libc++ for the Android platform since Lollipop, and that's been a change that our engineers have been overwhelmingly happy with. We were able to make this transition in the platform earlier than we could in the NDK because we didn't need libandroid_support, and could instead just update libc in place. In contrast to the other STLs currently available in the NDK, libc++ fully supports C++11, C++14, and most of C++1z! Stlport hasn't had an update since 2008, and gnustl (what we call GNU's libstdc++, to avoid confusion with Bionic's libstdc++, which isn't an STL) historically hasn't worked very well with Clang, particularly in headers that are closely tied to compiler builtins like <atomic> and <type_traits>. We'll most likely be making libc++ the default in the next NDK release, but for now you can opt-in if you're not using it already by following the instructions below. Like the other STLs, libc++ is available as both a static and shared library. Which one you should use depends on your specific circumstances as described in our docs, but tl;dr use the static version if you have one and only one shared library in your application, and use the shared one in all other cases. If you've read our roadmap, you've seen that we've planned to expand libandroid_support to backport as much of libc/libm as possible. Whenever we've spoken with people about this, we've received lukewarm responses at best. Given that this doesn't seem to be a thing that people are interested in, and that it would be something that increases library size (and therefore APK size, which is something everyone seems very interested in), we no longer plan to do this. If we've misinterpreted your response or if we haven't heard from you and this is something you want, please let us know! tl;dr: Don't set _FILE_OFFSET_BITS=64 if you want to keep the behavior present in old NDKs. Historically, setting _FILE_OFFSET_BITS=64 in the NDK did nothing. This feature was not present in the deprecated headers at all. With unified headers, the NDK now has up to date headers with support for this feature. _FILE_OFFSET_BITS=64 is a macro you can define in your application to get support for a 64-bit off_t in 32-bit code. This works by both making off_t 64-bit (by default it is 32-bit in 32-bit code) and by implicitly replacing calls to APIs like lseek with calls to lseek64. Support for _FILE_OFFSET_BITS=64 was not added to Android in a single release. One API, lseek64, has always been in bionic. 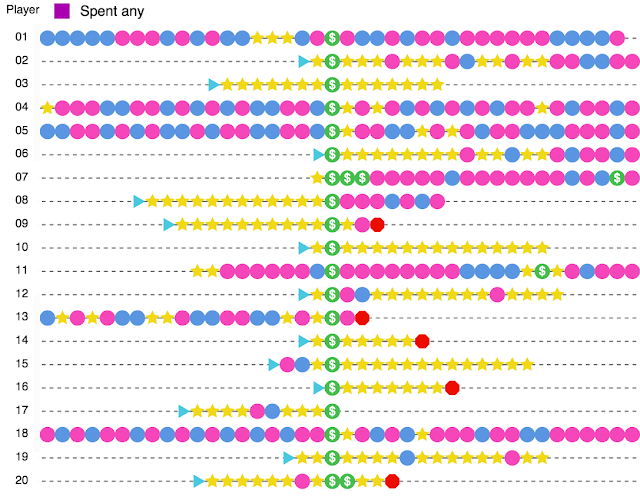 Most APIs were added in Lollipop, and a few more were not added until later releases. If you're targeting a release that does not support the 64-bit off_t variant of a function you are using and have set _FILE_OFFSET_BITS=64, the function will not be available. This is in contrast to the behavior for r15 and r15b (but matches r15c) where the functions were wrongly exposed with a 32-bit off_t that would be silently truncated. Note that the 64-bit off_t APIs are still available without _FILE_OFFSET_BITS=64 under different names. For example, instead of lseek, call lseek64. Instead of off_t, use off64_t. Finally, since this feature is new to the NDK with unified headers, if you just want to return to the pre-unified headers behavior, all you need to do is stop setting _FILE_OFFSET_BITS=64. 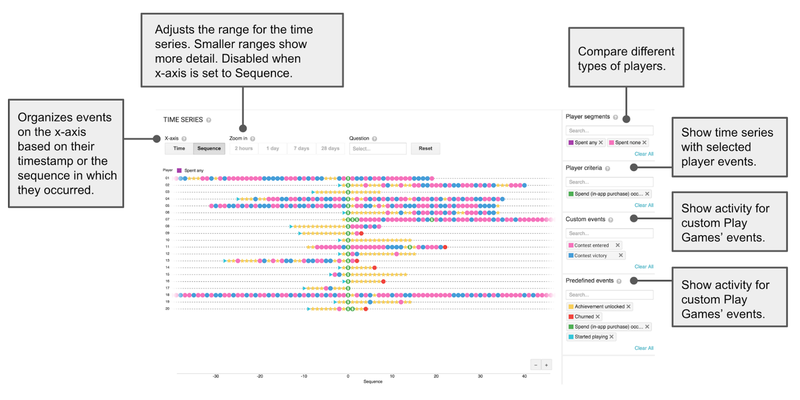 For more information about off_t ABI details in bionic, see the Bionic 32-bit ABI bugs doc. 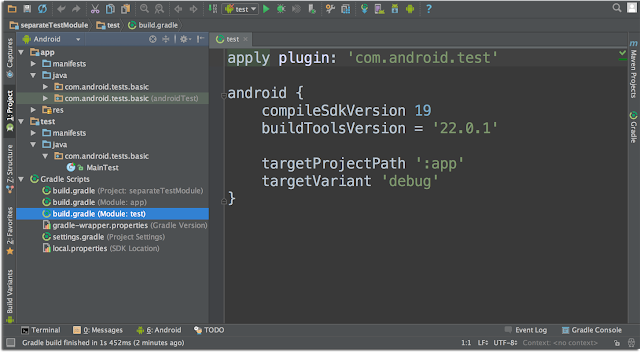 In addition to supporting the experimental Gradle plugin, Android Studio 2.2 enables you to build C/C++ components of Android projects using CMake and ndk-build. 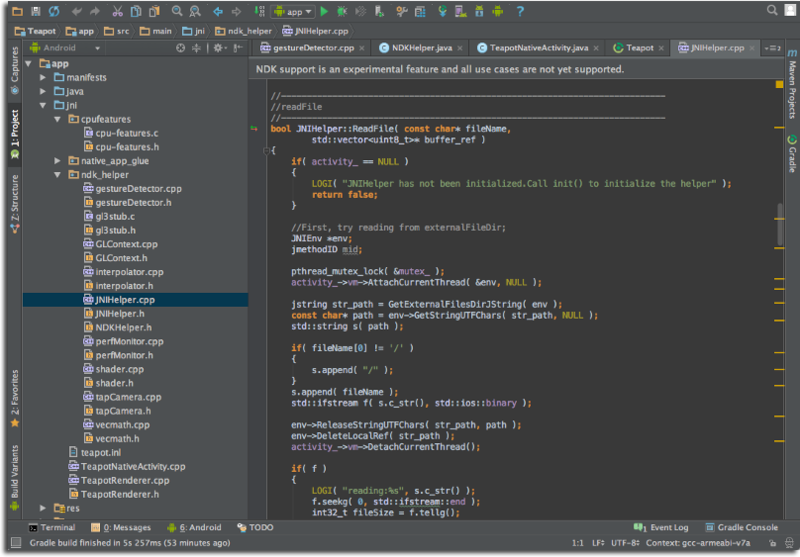 The Android Studio team plans to continue to support the experimental Gradle plugin. This will eventually replace the current Gradle plugin, providing additional tightly-integrated benefits to C/C++ developers such as smarter dependency management. So if you're interested in someday having the smartest possible interface between your IDE and your build system, you shouldn't ignore the experimental plugin. For new projects, we recommend using CMake or experimental Gradle. For new Android projects with limited C++, we recommend trying the experimental Gradle plugin. For projects with substantial amounts of C++, or where you want the maximally stable build configuration, we recommend using a CMake build. 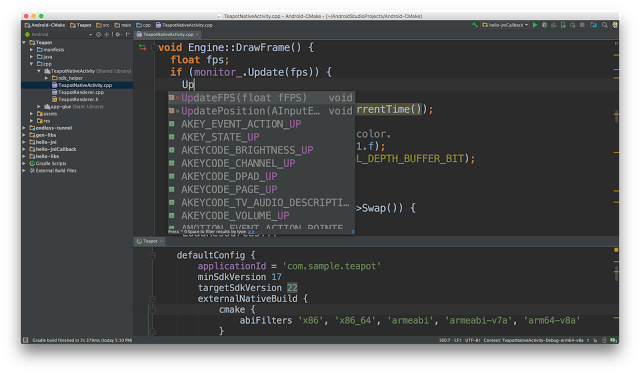 Android Studio intends CMake to be a permanently supported solution. While we think that there are substantial advantages to having a single build system able to handle all parts of an Android application, stabilizing the experimental plugin is not an option for us because it relies on Gradle APIs that are still a work in progress. Until the Gradle APIs are stabilized, the experimental plugin will keep changing, particularly in its Domain Specific Language, and will be strictly tied to a very specific version of Gradle itself. Note that the the old, undocumented ndkCompile integration is deprecated. If you are using it, you need to move away from it as we'll remove it completely in the near future. We recommend migrating to gradle+cmake via our migration guide. We no longer support the Eclipse ADT. To get started migrating, download and install Android Studio. For most projects, migration is as simple as importing your existing Eclipse ADT projects in Android Studio with the File → New→ Import Project menu option. 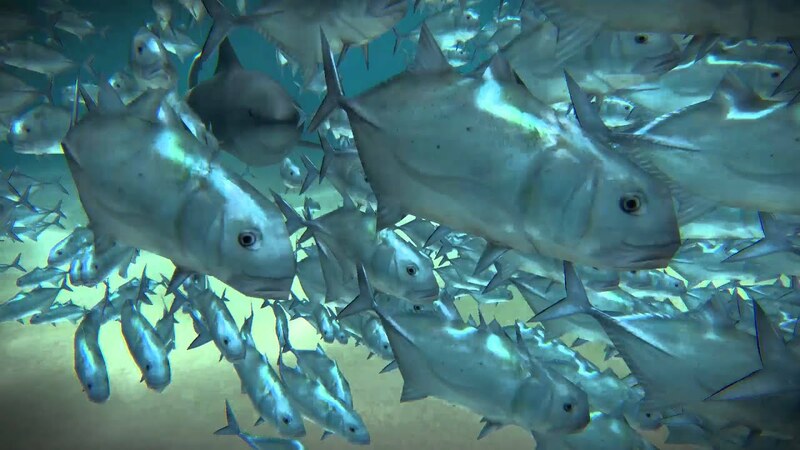 For more details on the migration process, check out the migration guide. We're dedicated to making Android Studio the best possible integrated development environment for building Android apps, so if there are missing features or other challenges preventing you from using Android Studio, we want to hear about it [please take our survey]. You can also file bugs or feature requests directly with the team, and let us know via our Twitter or Google+ accounts. 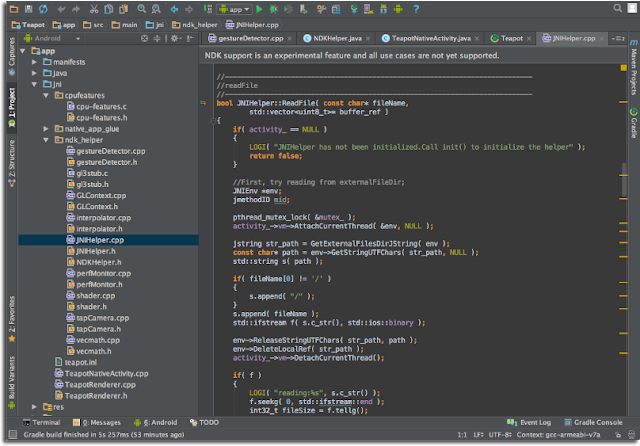 Android Studio is an open source project, available to all at no cost. Check out our Open Source project page if you're interested in contributing or learning more. Related to other improvements to the Android platform, the dynamic linker in Android M and N has stricter requirements for writing clean, cross-platform compatible native code in order to load. It is necessary that an application’s native code follows the rules and recommendations in order to ensure a smooth transition to recent Android releases. Below we outline in detail each individual change related to native code loading, the consequences and steps you can take to avoid issues. Required tools: there is an <arch>-linux-android-readelf binary (e.g. arm-linux-androideabi-readelf or i686-linux-android-readelf) for each architecture in the NDK (under toolchains/), but you can use readelf for any architecture, as we will be doing basic inspection only. On Linux you need to have the “binutils” package installed for readelf, and “pax-utils” for scanelf. Native libraries must use only public API, and must not link against non-NDK platform libraries. Starting with API 24 this rule is enforced and applications are no longer able to load non-NDK platform libraries. The rule is enforced by the dynamic linker, so non-public libraries are not accessible regardless of the way code tries to load them: System.loadLibrary(...), DT_NEEDED entries, and direct calls to dlopen(...) will fail in exactly the same way. Users should have a consistent app experience across updates, and developers shouldn’t have to make emergency app updates to handle platform changes. For that reason, we recommend against using private C/C++ symbols. Private symbols aren’t tested as part of the Compatibility Test Suite (CTS) that all Android devices must pass. They may not exist, or they may behave differently. This makes apps that use them more likely to fail on specific devices, or on future releases --- as many developers found when Android 6.0 Marshmallow switched from OpenSSL to BoringSSL. In order to reduce the user impact of this transition, we’ve identified a set of libraries that see significant use from Google Play’s most-installed apps, and that are feasible for us to support in the short term (including libandroid_runtime.so, libcutils.so, libcrypto.so, and libssl.so). In order to give you more time to transition, we will temporarily support these libraries; so if you see a warning that means your code will not work in a future release -- please fix it now! Potential problems: starting from API 24 the dynamic linker will not load private libraries, preventing the application from loading. Resolution: rewrite your native code to rely only on public API. As a short term workaround, platform libraries without complex dependencies (libcutils.so) can be copied to the project. As a long term solution the relevant code must be copied to the project tree. SSL/Media/JNI internal/binder APIs should not be accessed from the native code. When necessary, native code should call appropriate public Java API methods. A complete list of public libraries is available within the NDK, under platforms/android-API/usr/lib. Note: SSL/crypto is a special case, applications must NOT use platform libcrypto and libssl libraries directly, even on older platforms. All applications should use GMS Security Provider to ensure they are protected from known vulnerabilities. Resolution: remove the extra steps from your build that strip section headers. Starting with API 23, shared objects must not contain text relocations. That is, the code must be loaded as is and must not be modified. Such an approach reduces load time and improves security. Note: it is technically possible to have a shared object with the TEXTREL entry/flag but without any actual text relocations. This doesn’t happen with the NDK, but if you’re generating ELF files yourself make sure you’re not generating ELF files that claim to have text relocations, because the Android dynamic linker trusts the entry/flag. Potential problems: Relocations enforce code pages being writable, and wastefully increase the number of dirty pages in memory. The dynamic linker has issued warnings about text relocations since Android K (API 19), but on API 23 and above it refuses to load code with text relocations. Resolution: rewrite assembler to be position independent to ensure no text relocations are necessary. Check the Gentoo documentation for cookbook recipes. While library dependencies (DT_NEEDED entries in the ELF headers) can be absolute paths, that doesn’t make sense on Android because you have no control over where your library will be installed by the system. A DT_NEEDED entry should be the same as the needed library’s SONAME, leaving the business of finding the library at runtime to the dynamic linker. Before API 23, Android’s dynamic linker ignored the full path, and used only the basename (the part after the last ‘/’) when looking up the required libraries. Since API 23 the runtime linker will honor the DT_NEEDED exactly and so it won’t be able to load the library if it is not present in that exact location on the device. Even worse, some build systems have bugs that cause them to insert DT_NEEDED entries that point to a file on the build host, something that cannot be found on the device. Potential problems: before API 23 the DT_NEEDED entry’s basename was used, but starting from API 23 the Android runtime will try to load the library using the path specified, and that path won’t exist on the device. There are broken third-party toolchains/build systems that use a path on a build host instead of the SONAME. Resolution: make sure all required libraries are referenced by SONAME only. It is better to let the runtime linker to find and load those libraries as the location may change from device to device. Each ELF shared object (“native library”) must have a SONAME (Shared Object Name) attribute. The NDK toolchain adds this attribute by default, so its absence indicates either a misconfigured alternative toolchain or a misconfiguration in your build system. A missing SONAME may lead to runtime issues such as the wrong library being loaded: the filename is used instead when this attribute is missing. Potential problems: namespace conflicts may lead to the wrong library being loaded at runtime, which leads to crashes when required symbols are not found, or you try to use an ABI-incompatible library that isn’t the library you were expecting. Resolution: the current NDK generates the correct SONAME by default. Ensure you’re using the current NDK and that you haven’t configured your build system to generate incorrect SONAME entries (using the -soname linker option). Please remember, clean, cross-platform code built with a current NDK should have no issues on Android N. We encourage you to revise your native code build so that it produces correct binaries. As documented in the Android N behavioral changes, to protect Android users and apps from unforeseen crashes, Android N will restrict which libraries your C/C++ code can link against at runtime. As a result, if your app uses any private symbols from platform libraries, you will need to update it to either use the public NDK APIs or to include its own copy of those libraries. Some libraries are public: the NDK exposes libandroid, libc, libcamera2ndk, libdl, libGLES, libjnigraphics, liblog, libm, libmediandk, libOpenMAXAL, libOpenSLES, libstdc++, libvulkan, and libz as part of the NDK API. Other libraries are private, and Android N only allows access to them for platform HALs, system daemons, and the like. If you aren’t sure whether your app uses private libraries, you can immediately check it for warnings on the N Developer Preview. We’re making this change because it’s painful for users when their apps stop working after a platform update. Whether they blame the app developer or the platform, everybody loses. Users should have a consistent app experience across updates, and developers shouldn’t have to make emergency app updates to handle platform changes. For that reason, we recommend against using private C/C++ symbols. 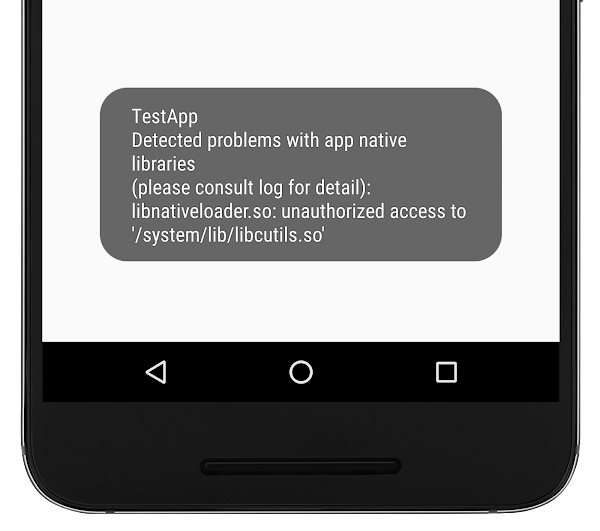 Private symbols aren’t tested as part of the Compatibility Test Suite (CTS) that all Android devices must pass. They may not exist, or they may behave differently. This makes apps that use them more likely to fail on specific devices, or on future releases — as many developers found when Android 6.0 Marshmallow switched from OpenSSL to BoringSSL. You may be surprised that there’s no STL in the list of NDK libraries. The three STL implementations included in the NDK — the LLVM libc++, the GNU STL, and libstlport — are intended to be bundled with your app, either by statically linking into your library, or by inclusion as a separate shared library. In the past, some developers have assumed that they didn’t need to package the library because the OS itself had a copy. This assumption is incorrect: a particular STL implementation may disappear (as was the case with stlport, which was removed in Marshmallow), may never have been available (as is the case with the GNU STL), or it may change in ABI incompatible ways (as is the case with the LLVM libc++). In order to reduce the user impact of this transition, we’ve identified a set of libraries that see significant use from Google Play’s most-installed apps, and that are feasible for us to support in the short term (including libandroid_runtime.so, libcutils.so, libcrypto.so, and libssl.so). For legacy code in N, we will temporarily support these libraries in order to give you more time to transition. Note that we don't intend to continue this support in any future Android platform release, so if you see a warning that means your code will not work in a future release — please fix it now! Table 1. What to expect if your app is linking against private native libraries. Please test your app during the N Previews. All public NDK libraries (libandroid, libc, libcamera2ndk, libdl, libGLES, libjnigraphics, liblog, libm, libmediandk, libOpenMAXAL, libOpenSLES, libstdc++, libvulkan, and libz), plus libraries that are part of your app are accessible. For all other libraries you’ll see a warning in logcat and a toast on the display. This will happen only if your app’s targetSdkVersion is less than N. If you change your manifest to target N, loading will fail: Java’s System.loadLibrary will throw, and C/C++’s dlopen(3) will return NULL. Test your apps on the Developer Preview — if you see a toast like this one, your app is accessing private native APIs. Please fix your code soon! All NDK libraries (libandroid, libc, libcamera2ndk, libdl, libGLES, libjnigraphics, liblog, libm, libmediandk, libOpenMAXAL, libOpenSLES, libstdc++, libvulkan, and libz), plus libraries that are part of your app are accessible. For the temporarily accessible libraries (such as libandroid_runtime.so, libcutils.so, libcrypto.so, and libssl.so), you’ll see a warning in logcat for all API levels before N, but loading will fail if you update your app so that its targetSdkVersion is N or later. Attempts to load any other libraries will fail in the final release of Android N, even if your app is targeting a pre-N platform version. In O, all access to the temporarily accessible libraries will be removed. 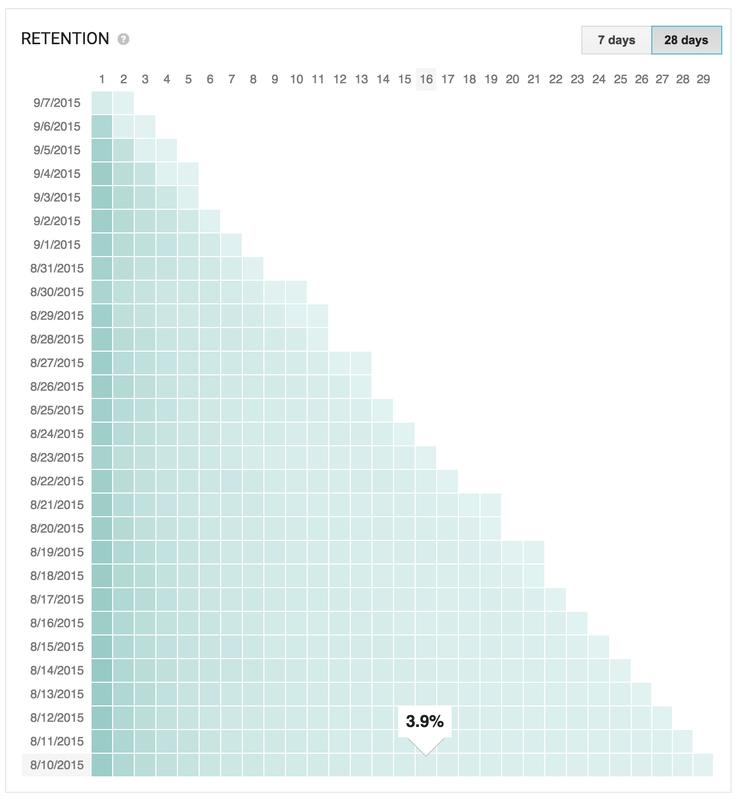 As a result, you should plan to update your app regardless of your targetSdkVersion prior to O. If you believe there is missing functionality from the NDK API that will make it impossible for you to transition off a temporarily accessible library, please file a bug here. What do the errors look like? 03-21 17:07:51.502 31234 31234 W linker  : library "libandroid_runtime.so"
This is telling you that your library “libapplib.so” refers to the library “libandroid_runtime.so”, which is a private library. java.lang.UnsatisfiedLinkError: dlopen failed: library "libcutils.so"
("/system/lib/libcutils.so") needed or dlopened by "/system/lib/libnativeloader.so"
is not accessible for the namespace "classloader-namespace"
If you’re using dlopen(3) from C/C++ you’ll get a NULL return and dlerror(3) will return the same “dlopen failed...” string as shown above. For more information about how to check if your app is using private symbols, see the FAQ on developer.android.com. Today we're pleased to bring you a preview of Android development tools for Vulkan™. Vulkan is a new 3D rendering API which we’ve helped to develop as a member of Khronos, geared at providing explicit, low-overhead GPU (Graphics Processor Unit) control to developers. Vulkan’s reduction of CPU overhead allows some synthetic benchmarks to see as much as 10 times the draw call throughput on a single core as compared to OpenGL ES. Combined with a threading-friendly API design which allows multiple cores to be used in parallel with high efficiency, this offers a significant boost in performance for draw-call heavy applications. To help developers start coding quickly, we’ve put together a set of samples and guides that illustrate how to use Vulkan effectively. There are many similarities between OpenGL ES and Vulkan, but Vulkan offers new features for developers who need to make every millisecond count. Application control of memory allocation. Vulkan provides mechanisms for fine-grained control of how and when memory is allocated on the GPU. This allows developers to use their own allocation and recycling policies to fit their application, ultimately reducing execution and memory overhead and allowing applications to control when expensive allocations occur. Asynchronous command generation. In OpenGL ES, draw calls are issued to the GPU as soon as the application calls them. In Vulkan, the application instead submits draw calls to command buffers, which allows the work of forming and recording the draw call to be separated from the act of issuing it to the GPU. By spreading command generation across several threads, applications can more effectively make use of multiple CPU cores. These command buffers can also be reused, reducing the overhead involved in command creation and issuance. No hidden work. One OpenGL ES pitfall is that some commands may trigger work at points which are not explicitly spelled out in the API specification or made obvious to the developer. Vulkan makes performance more predictable and consistent by specifying which commands will explicitly trigger work and which will not. Multithreaded design, from the ground up. All OpenGL ES applications must issue commands for a context only from a single thread in order to render predictably and correctly. By contrast, Vulkan doesn’t have this requirement, allowing applications to do work like command buffer generation in parallel— but at the same time, it doesn’t make implicit guarantees about the safety of modifying and reading data from multiple threads at the same time. The power and responsibility of managing thread synchronization is in the hands of the application. Mobile-friendly features. Vulkan includes features particularly helpful for achieving high performance on tiling GPUs, used by many mobile devices. Applications can provide information about the interaction between separate rendering passes, allowing tiling GPUs to make effective use of limited memory bandwidth, and avoid performing off-chip reads. Offline shader compilation. Vulkan mandates support for SPIR-V, an intermediate language for shaders. This allows developers to compile shaders ahead of time, and ship SPIR-V binaries with their applications. These binaries are simpler to parse than high-level languages like GLSL, which means less variance in how drivers perform this parsing. SPIR-V also opens the door for third parties to provide compilers for specialized or cross-platform shading languages. Optional validation. OpenGL ES validates every command you call, checking that arguments are within expected ranges, and objects are in the correct state to be operated upon. Vulkan doesn’t perform any of this validation itself. Instead, developers can use optional debug tools to ensure their calls are correct, incurring no run-time overhead in the final product. As noted above, Vulkan’s lack of implicit validation requires developers to make use of tools outside the API in order to validate their code. Vulkan’s layer mechanism allows validation code and other developer tools to inspect every API call during development, without incurring any overhead in the shipping version. Our guides show you how to build the validation layers for use with the Android NDK, giving you the tools necessary to build bug-free Vulkan code from start to finish. The Shaderc collection of tools provides developers with build-time and run-time tools for compiling GLSL into SPIR-V. Shaders can be compiled at build time using glslc, a command-line compiler, for easy integration into existing build systems. Or, for shaders which are generated or edited during execution, developers can use the Shaderc library to compile GLSL shaders to SPIR-V via a C interface. Both tools are built on top of Khronos’s reference compiler. The Android Support Library is a collection of libraries available on a wide array of API levels that help you focus on the unique parts of your app, providing pre-built components, new functionality, and compatibility shims. With the latest release of the Android Support Library (23.1), you will see improvements across the Support V4, Media Router, RecyclerView, AppCompat, Design, Percent, Custom Tabs, Leanback, and Palette libraries. Let’s take a closer look. The Support V4 library focuses on making supporting a wide variety of API levels straightforward with compatibility shims and backporting specific functionality. NestedScrollView is a ScrollView that supports nested scrolling back to API 4. You’ll now be able to set a OnScrollChangeListener to receive callbacks when the scroll X or Y positions change. There are a lot of pieces that make up a fully functioning media playback app, with much of it centered around MediaSessionCompat. A media button receiver, a key part to handling playback controls from hardware or bluetooth controls, is now formalized in the new MediaButtonReceiver class. This class makes it possible to forward received playback controls to a Service which is managing your MediaSessionCompat, reusing the Callback methods already required for API 21+, centralizing support on all API levels and all media control events in one place. A simplified constructor for MediaSessionCompat is also available, automatically finding a media button receiver in your manifest for use with MediaSessionCompat. The Media Router Support Library is the key component for connecting and sending your media playback to remote devices, such as video and audio devices with Google Cast support. It also provides the mechanism, via MediaRouteProvider, to enable any application to create and manage a remote media playback device connection. In this release, MediaRouteChooserDialog (the dialog that controls selecting a valid remote device) and MediaRouteControllerDialog (the dialog to control ongoing remote playback) have both received a brand new design and additional functionality as well. 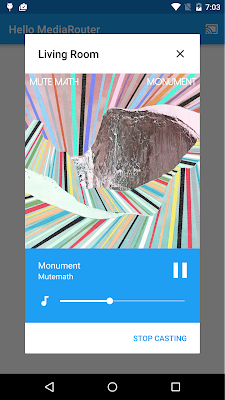 You’ll find the chooser dialog sorts devices by frequency of use and includes a device type icon for easy identification of different devices while the controller dialog now shows current playback information (including album art). RecyclerView is an extremely powerful and flexible way to show a list, grid, or any view of a large set of data. One advantage over ListView or GridView is the built in support for animations as items are added, removed, or repositioned. This release significantly changes the animation system for the better. By using the new ItemAnimator’s canReuseUpdatedViewHolder() method, you’ll be able to choose to reuse the existing ViewHolder, enabling item content animation support. The new ItemHolderInfo and associated APIs give the ItemAnimator the flexibility to collect any data it wants at the correct point in the layout lifecycle, passing that information into the animate callbacks. One component of the AppCompat Support Library has been in providing a consistent set of widgets across all API levels, including the ability to tint those widgets to match your branding and accent colors. This release adds tint aware versions of SeekBar (for tinting the thumb) as well as ImageButton and ImageView (providing backgroundTint support) which will automatically be used when you use the platform versions in your layouts. You’ll also find that SwitchCompat has been updated to match the styling found in Android 6.0 Marshmallow. The Design Support Library includes a number of components to help implement the latest in the Google design specifications. TextInputLayout expands its existing functionality of floating hint text and error indicators with new support for character counting. 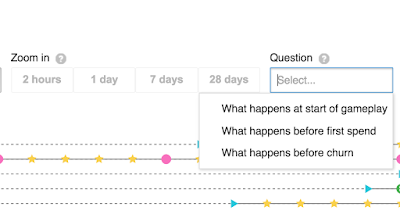 AppBarLayout supports a number of scroll flags which affect how children views react to scrolling (e.g. scrolling off the screen). New to this release is SCROLL_FLAG_SNAP, ensuring that when scrolling ends, the view is not left partially visible. Instead, it will be scrolled to its nearest edge, making fully visible or scrolled completely off the screen. You’ll also find that AppBarLayout now allows users to start scrolling from within the AppBarLayout rather than only from within your scrollable view - this behavior can be controlled by adding a DragCallback. NavigationView provides a convenient way to build a navigation drawer, including the ability to creating menu items using a menu XML file. We’ve expanded the functionality possible with the ability to set custom views for items via app:actionLayout or using MenuItemCompat.setActionView(). The Percent Support Library provides percentage based dimensions and margins and, new to this release, the ability to set a custom aspect ratio via app:aspectRatio. By setting only a single width or height and using aspectRatio, the PercentFrameLayout or PercentRelativeLayout will automatically adjust the other dimension so that the layout uses a set aspect ratio. The Custom Tabs Support Library allows your app to utilize the full features of compatible browsers including using pre-existing cookies while still maintaining a fast load time (via prefetching) and a custom look and actions. In this release, we’re adding a few additional customizations such as hiding the url bar when the page is scrolled down with the new enableUrlBarHiding() method. You’ll also be able to update the action button in an already launched custom tab via your CustomTabsSession with setActionButton() - perfect for providing a visual indication of a state change. Navigation events via CustomTabsCallback#onNavigationEvent() have also been expanded to include the new TAB_SHOWN and TAB_HIDDEN events, giving your app more information on how the user interacts with your web content. The Leanback library makes it easy to build user interfaces on TV devices. This release adds GuidedStepSupportFragment for a support version of GuidedStepFragment as well as improving animations and transitions and allowing GuidedStepFragment to be placed on top of existing content. You’ll also be able to annotate different types of search completions in SearchFragment and staggered slide transition support for VerticalGridFragment. Palette, used to extract colors from images, now supports extracting from a specific region of a Bitmap with the new setRegion() method. There’s no better time to get started with the Android Support Library. You can get started developing today by updating the Android Support Repository from the Android SDK Manager. For an in depth look at every API change in this release, check out the full API diff. Previewed earlier this summer at Google I/O, Android Studio 1.3 is now available on the stable release channel. We appreciated the early feedback from those developers on our canary and beta channels to help ship a great product. Android Studio 1.3 is our biggest feature release for the year so far, which includes a new memory profiler, improved testing support, and full editing and debugging support for C++. Let’s take a closer look. 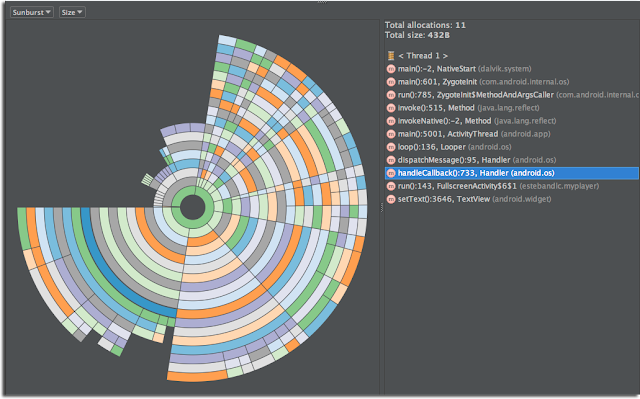 Android Studio now allows you to capture and analyze memory snapshots in the native Android HPROF format. 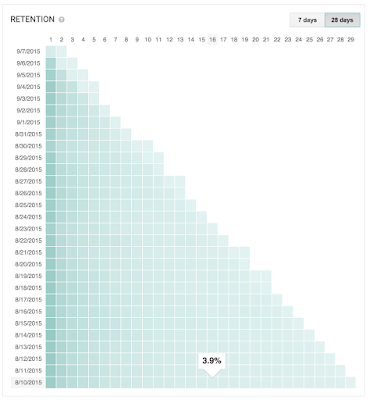 In addition to displaying a table of memory allocations that your app uses, the updated allocation tracker now includes a visual way to view the your app allocations. For more flexibility in app testing, you now have the option to place your code tests in a separate module and use the new test plugin (‘com.android.test’) instead of keeping your tests right next to your app code. This feature does require your app project to use the Gradle Plugin 1.3. Android Studio now has inline code annotation support to help you manage the new app permissions model in the M release of Android. Learn more about code annotations. New data brinding features allow you to create declarative layouts in order to minimize boilerplate code by binding your application logic into your layouts. 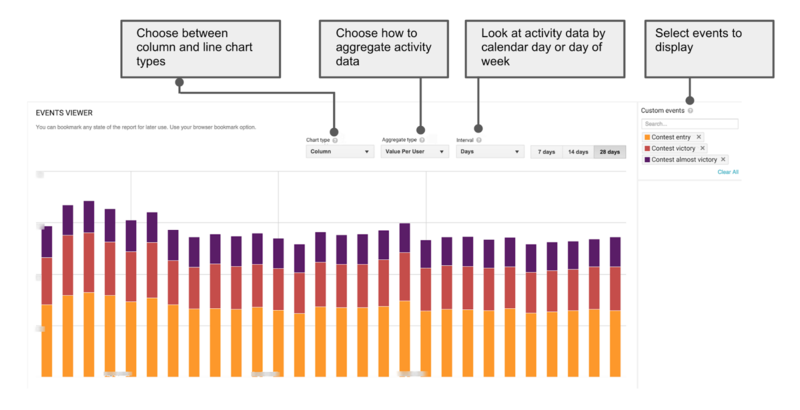 Learn more about data binding. 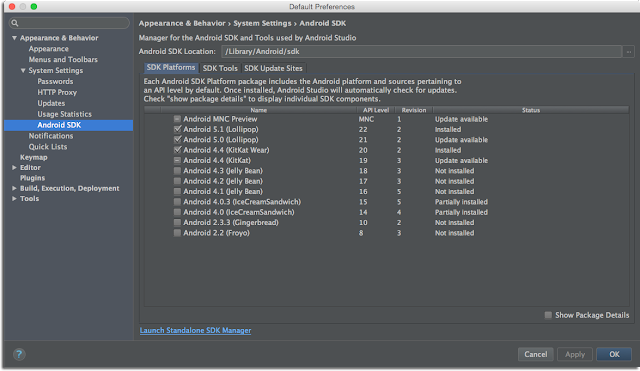 Managing Android SDK updates is now a part of the Android Studio. 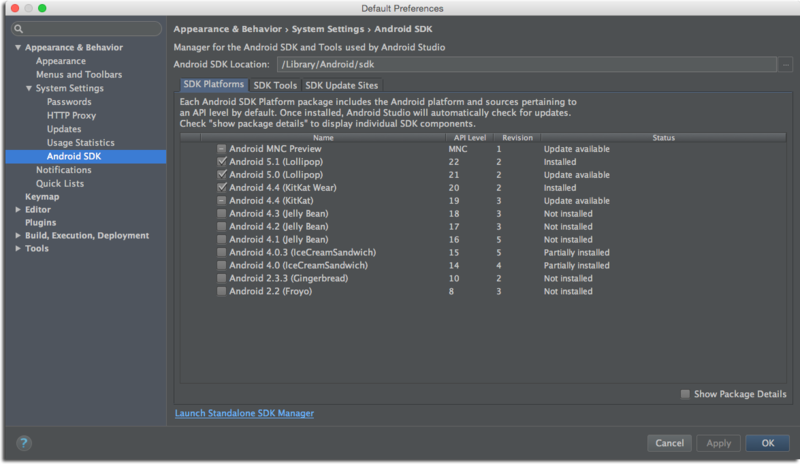 By default, Android Studio will now prompt you about new SDK & Tool updates. You can still adjust your preferences with the new & integrated Android SDK Manager. As a part of the Android 1.3 stable release, we included an Early Access Preview of the C++ editor & debugger support paired with an experimental build plugin. See the Android C++ Preview page for information on how to get started. 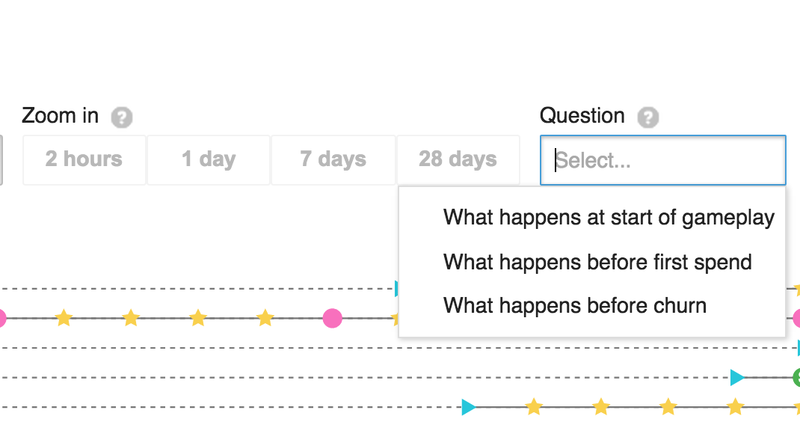 Support for more complex projects and build configurations is in development, but let us know your feedback. An important thing to remember is that an update to Android Studio does not require you to change your Android app projects. With updating, you get the latest features but still have control of which build tools and app dependency versions you want to use for your Android app. 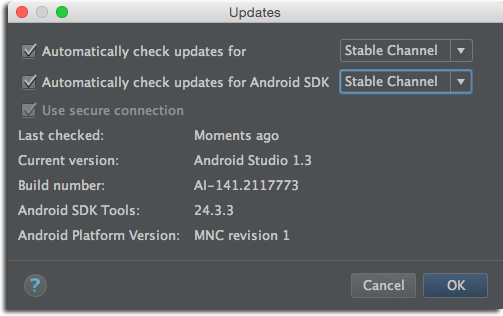 For current developers on Android Studio, you can check for updates from the navigation menu. For new users, you can learn more about Android Studio on the product overview page or download the stable version from the Android Studio download site. 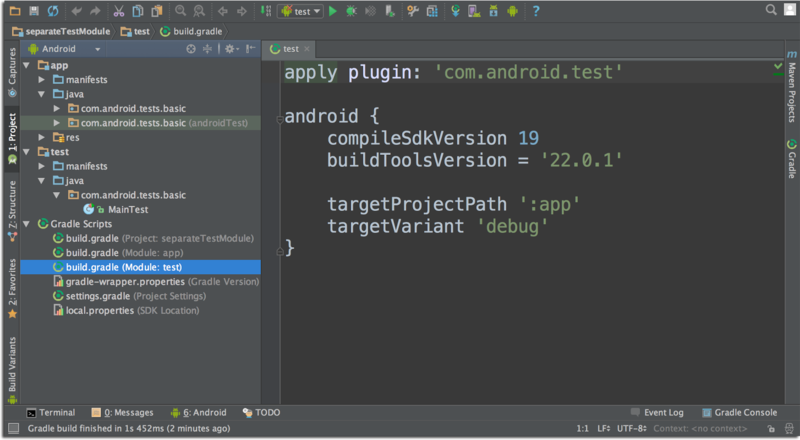 We are excited to launch this set of features in Android Studio and we are hard at work developing the next set of tools to make develop Android development easier on Android Studio. As always we welcome feedback on how we can help you. 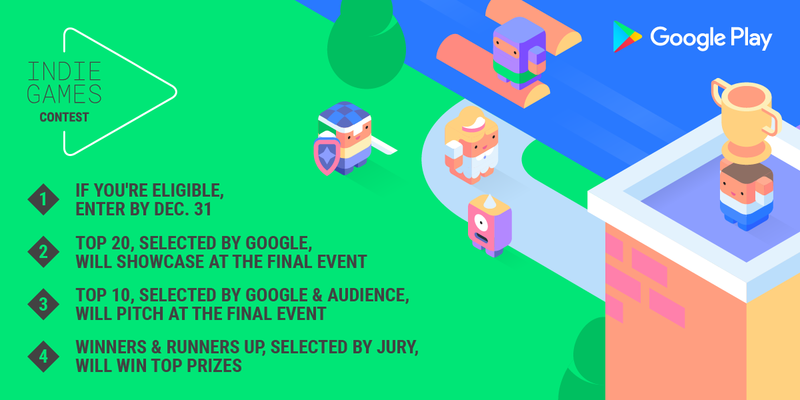 Connect with the Android developer tools team on Google+.